Food sensitivities are something I used to have. Before I got my adrenal exhaustion diagnosis in 2000, it seemed my food sensitivities just kept changing. I would get tested by my doctor with a blood sample, and every time, my sensitivities changed. I was now eliminating more foods, which initially helped. But then symptoms would return within a year, and I would go through the same cycle of test, eliminate, feel better, feel worse again. How do you fix this worsening food sensitivities issue? You have to work on the gut imbalances and improve digestion after you eliminate the acute food offenders. Yes, the food sensitivities are real. But they are not supposed to keep changing! 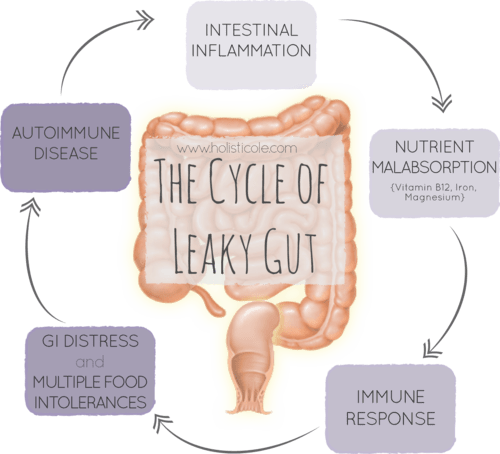 What I learned from my own experience and with clients is that there is an imbalance in the gut and a degradation of the digestive tract in its ability to break down and digest food. This is what needs to be corrected or the sensitivities will be ever changing! Step 1 – Identify the foods that are aggravating the situation now. How? I use Nutrition Response Testing to verify what I already can see via food logs my clients submit. Usually, there are a few food items that are fueling the inflammation that is burning in the gut. You need to remove them for 2 months minimum to let the inflammation decrease before reintroducing that food again. I often recommend eliminating 1 food at a time, so you know specifically what happens with the one food is removed. Remove too many, and who knows which was really the problem? Who knows what to eat instead? Which is the next step…. Step 2 – Eliminate the foods causing the current flare up and replace with alternatives that do not aggravate the symptoms. For example, if wheat is an issues (gas, bloating, distention, brain fog, incessant cravings, etc), then I also test other grains to make sure we don’t replace the ‘bad’ grain with another ‘bad’ grain like brown rice (many gluten free products contain this which can result in the same symptoms as eating the wheat). I confirm this with the Nutrition Response Testing. And also suggest alternate grains and root vegetables. I have many recipes on my blog as well which are grain-free such as Sweet Potato Brownies, Cauliflower and Sweet Potato pizza crust and Vegetable Flatbreads. There are always other options once you know what they are! I remember when I had gotten my first food allergy test results, I had no idea what to eat. So I hardly ate anything – I now wonder, did I lose 13 pounds in 2 weeks because I removed the inflammatory food? Or was a big part of that because I just wasn’t eating? I vowed as a nutrition coach, that I would help my clients KNOW what the alternatives are. It is no fun guessing or starving! Step 3 – Add supplements to rebuild the intestinal flora balance and improve digestion. These include probiotics and sometimes pre-biotics. Sometimes, the digestion is needing support, so a digestive enzyme may also be needed. I will choose the right one for you as not all digestive enzymes are the same. 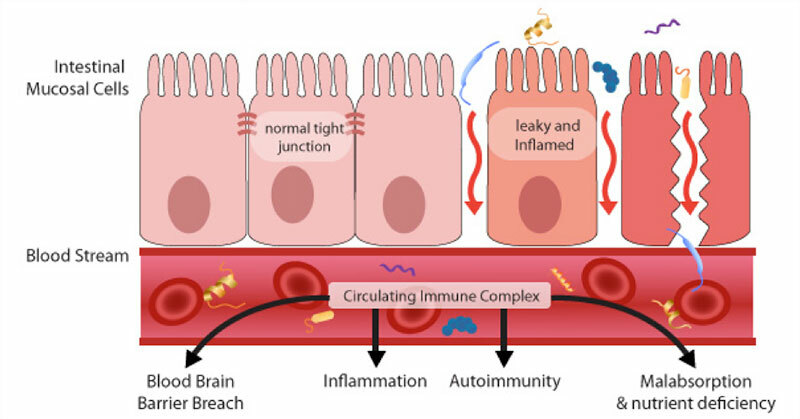 There is a condition called leaky gut (permeability of the intestinal wall) which causes undigested food particles to cross into the blood stream. This is usually where the problem lies in terms of the every changing sensitivities to foods! Improving the digestion can help. But if you don’t improve this impermeability situation, the problem will return but with new food sensitivities. The rebuilding of the gut lining may also include specific amino acids like l-Glutamine which is known to be depleted when under stress. Endurance athletes commonly are depleted of this amino acid and suffer from IBS like symptoms as a result. But it is usually a combination of the right probiotics for either lower or upper GI, sometimes both! This is how to fix the worsening food sensitivities! Step 4 – Reintroduce foods you eliminated after 2 months of avoidance and maintain a rotation diet. Often times, even when I was going through the changing food sensitivities, when you eat the same food over, and over, and over again day in and day out, the body actually develops a sensitivity to that very food! I know one of the tests I did, wheat, dairy and eggs came up. At the time, my every day breakfast, 5 of 7 days per week was fried eggs with a slice of Swiss cheese on a slice of toasted pecan raisin bread. Oh, it was sooo good! But I developed a sensitivity to all of those foods because I was eating them every day. Two years ago, I was eating peanuts daily. I developed a sensitivity to them – I got sleepy within 25 minutes of eating them. It was easy to avoid as even 2 peanuts were enough to make me snooze for 45 minutes. I stopped eating them and a year later tried them again. They seemed to be okay. But each time I start to eat them almost every day, I start getting that same symptom of sleepiness again. Once the inflammation response is gone (usually 2 months minimum), then you can reintroduce a food once every 4 days to not re-experience the symptoms. You may have to wait up to 72 hours sometimes to notice symptoms. Other times, you reintroduce it, and you get a reaction unlike what you had before when you were eating it daily. When I reintroduced wheat, my stomach was on fire. I also got brain fog that lasted a whole day after eating any wheat or drinking a beer. I never had those symptoms when I was eating it daily. Now I eat wheat occasionally, but take my Spectrazyme Gluten Digest enzyme when I do, so I can avoid the negative symptoms. If you do experience a symptom, then you continue avoiding the food for another month. At this point, 1 more month is not a big deal as you have done it for 2 already. You keep trying to reintroduce until you have no symptoms. And sometimes, you always do get symptoms, so you just avoid the food permanently. This process can take 2-6 months to fully balance itself to see complete relief of symptoms. But if you skip one, the food sensitivities will just keep changing and soon, even water will cause symptoms! If you are patient, and do the steps as I suggest, this is how you fix the worsening food sensitivities for good. If you are ready to schedule your Nutrition Response Testing session, or want to just set up a time to discuss your situation, contact me here. Once we find the cause of the symptoms, we can design a real food nutrition plan specifically for you.